How to recognize a TEN CENTS Confederate stamp and tell it from a 10-CENTS Confederate stamp and various reproductions are the topics of this guide. The CSA 9 is the second most elusive of the Confederate engraved issues. In many respects, it has a strong resemblance to the much more common but less costly CSA 11 and CSA 12. The characteristics of the CSA 9 that set it apart are easy to spot once you know what they are. This guide will illustrate those characteristics and compare them to the two similarly designed Confederate stamps. 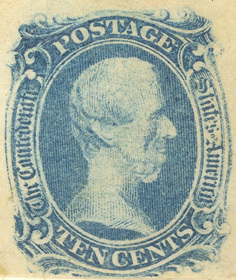 The CSA 9 has the value of the stamp expressed as "TEN CENTS". 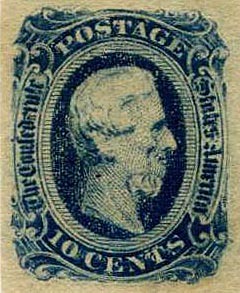 CSA 10, 11 and 12 have the value of the stamp expressed as "10 CENTS". This is the most readily visible detail in determining if you have a CSA 9 or something else. Confederate collectors refer to CSA as the "TEE-EE-NN" since the value is spelled out. In this illustration the CSA 9 is at the bottom, the CSA 11 is in the middle and the CSA 12 is at the top. An example of CSA 10 would very closely resemble that of CSA 11 with the addition of frame lines around the portrait. Scan comparison courtesy Robert Chambers. Number 9 has a blank area separating the background of the portrait from the oval frame. 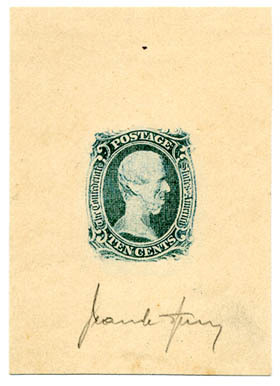 The background in the portrait oval in the CSA 9 is unique among these because it alone does not appear to have horizontal lines extending beyond the background area to reach the edges of the portrait oval. In fact, they are just so light that they are practically invisible unless scrutinized closely under high power magnification. CSA 10, CSA 11 and CSA 12 have more obvious horizontal lines connecting the cross-hatched area to the oval frame. Additionally, the portrait is a little bit higher in the oval in the CSA 9. The top of the illustration below is along a horizontal line between the "a" and "t" of "States". Notice that the CSA 11 and CSA 12 show forehead above the eyebrow below this imaginary, and arbitrary, line. Using the same positioning the portrait in the CSA 9 includes no eyebrow and no forehead. A look at the bottom of the CSA 9 portrait also shows that the rear point of the bust extends to the edge of the background. On CSA 10, 11 and 12 the rear point of the bust ends short of the edge of the crosshatching. portrait background and the oval frame of the portrait in the leftmost, CSA 9 example. The middle and right examples are CSA 11 and CSA 12 with more obvious cross-hatch lines. Another area of concern with this design relates to reproductions. Two of the best known reproductions are the Sperati forgery and the Springfield Facsimiles. These are the most commonly encountered of forgeries. Many years ago, a complete set of FACSIMILES were made up and marketed by a stamp dealer in Springfield, Massachusetts and these are known as "Springfield Facsimiles". 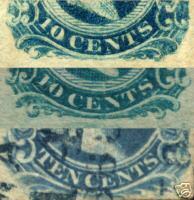 The yellowish paper of the Springfield reproductions is of a different texture than the genuine stamp. Frequently, this difference is apparent in the images used on eBay where they are offered in profusion. They are usually, but not always, described as facsimiles. 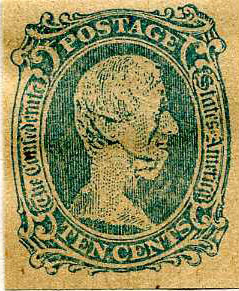 There is a distinct woven texture that is not present on the genuine stamps. The face of the stamps is not a clear printing as would be expected from a copper engraved plate printing. Detail present in the original is lacking in the flat looking reproduction. These will often be back-stamped "facsimile" in various ink colors. The most deceptive forgeries of Confederates general issues were done by Jean de Sperati, the French forgery genius. The color of the T-E-N is very close to the original and easily confused with the genuine issues. The Sperati forgeries are very well executed and dangerous to even experienced collectors. They have a "flat" look to the printing, the first thing for which to look and compare with a known genuine copy. There are three types of T-E-N Sperati forgeries. 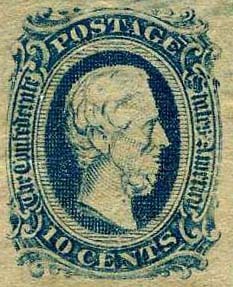 Type A (shown at left above, example from a die proof) has a small colorless dot that appears in the dark area between "Confederate" and "POSTAGE"; a second colorless flaw appears just after the "E" of "POSTAGE"; and the "e" of "The" is missing the dot which serves as a cross-bar. 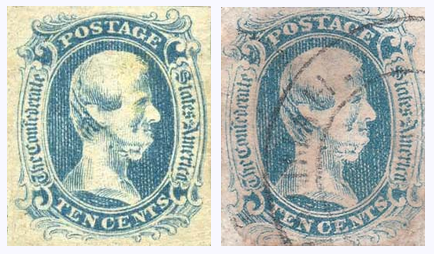 Type B (shown at right above) is similar to type A, but the colorless flaw between "Confederate" and "POSTAGE" is missing. The "T" and "E" of "TEN" appear to be joined at the top. "T" and "A" os "POSTAGE" are slightly closer together, with the bottom serifs touching or almost touching. The "used", actually more properly called "canceled" copy (center example above) bears the cancel, amusingly enough, of NEW PAID (YORK) / JUL / 10. This is clearly even more of a dead give-away than the uncanceled varieties. The two right examples above are Type B, from the private collection of Trish Kaufmann. Type C, illustrated above, was newly identified in 2009 by Steven M. Roth in collaboration with Leonard H. Hartmann. The scan is from the Hartmann collection and the description is provided with their permission. Type C is distinguished by the "T" and the "E" of TEN not being joined together, as in Types A and B. It still shows the universal colorless dot after the "E" of POSTAGE. This makes this the most dangerous of the Sperati types. This example is signed on the verso by Sperati. 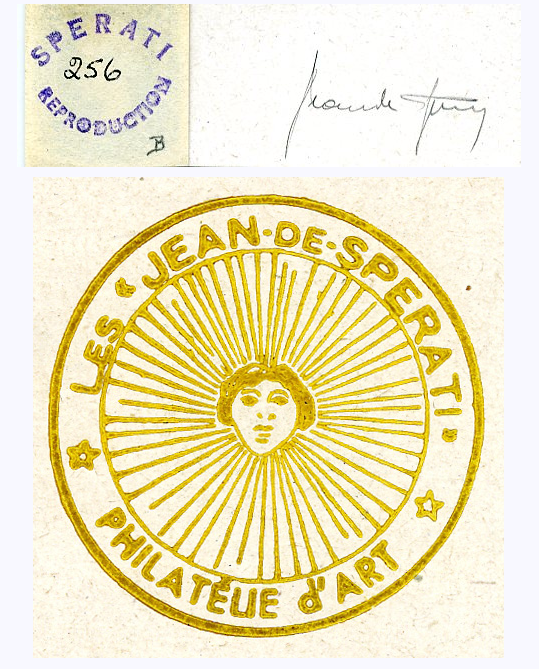 Some Sperati reproductions are signed by the maker, while others bear his "Reproduction" or "Philatelie d'art" backstamps. Above is a Sperati signed die proof of the "T-E-N" forgery, a scarce and very collectible item. Known Sperati cancellations: CHARLESTON / SC; CHATTANOOGA / Ten; CINCINNATI / O; DETROIT / Mi; MIDDLE BURY / Vt; MOBILE / Ala; PAID // NEW YORK // 12; NEW ORLEANS / LA. ; RICHMOND / Va. and 4 concentric circles (target) handstamp. All are black postmarks except the New York, which is also found in red. The "Toothless Old Man" forgery of the "T-E-N", by an unknown forger, is rather crude and would not fool an experienced collector of Confederates. It has a portrait background of only vertical lines. The lower jaw juts out relative to the lips. The hairline in front of the ear is heavily drawn and dark. 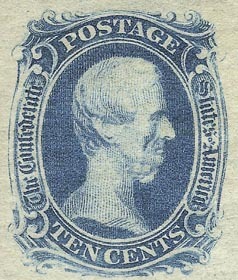 The front point of the bust is thicker than on the genuine stamp. Below the ear on line with the jaw line is a small dot of color that is not present on the original.